Poland, Hungary, Slovakia and the Czech Republic have joined forces in an effort to spur a less centralized Europe. The move comes weeks after the United Kingdom voted to leave the European Union. The vote caused a ripple across markets worldwide as the world awaits Britain’s path moving forward. Slovakia is taking the current presidency of the European Union seriously. The country has paid for massive upgrades to the tune of €14m to add new benches, rubbish bins and fill potholes in Bratislava. The country has also lined green spaces with mobile toilets, and free wireless access has been installed, too. The move is a direct response to the country’s rotating role. The agenda for the country has come to a stop following Brexit. “No one saw it coming,” states one analyst from Poland. Robert Fico, the Prime Minister of Slovakia, has the difficult task of representing his country of 5.5 million people at a time when the economic atmosphere has changed drastically. “Brexit is the number one order,” according to the country’s foreign minister. Fears among Poland, Hungary, Slovakia and the Czech Republic (V4) is that Germany will move hastily to speed up European Union integration. The countries are afraid their voices will be marginalized as a result. 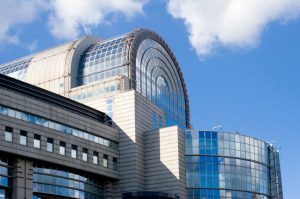 The coming months following Britain’s exit from the EU could also allow these members to play a more integral part in the EU’s decision making. It’s a chance for smaller members of the EU to have their voices heard. The concerns of all four countries’ citizens need to be heard and reflected in the new EU following Brexit. The UK was the voice of all of the countries before Brexit. Partners with all four countries, London held a common viewpoint on European problems, according to Polish foreign minister Witold Waszczykowksi. Estimates also put 1.2 million citizens of all four countries in the UK. These citizens face uncertainty following Brexit. 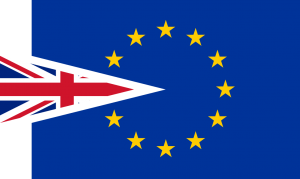 Labour markets in the United Kingdom were immediately opened following the formation of the EU, which allowed workers from all across the EU to work in London. Germany and France offered a transitional period to allow workers to enter their respective labour markets. V4 leaders are further concerned that the views of Germany and France on integration will be at the forefront of the agenda moving forward. Britain’s view was to expand the European Union rather than furthering integration. The V4 also lost a partner that held the same views on Russia and the need to sanction the country as necessary. Issues following Brexit immediately showed concern for the V4, as Germany invited only the first six founding members of the EU to Berlin. The founding members were invited by Frank-Walter Steinmeier, German foreign minister, to pledge support for a stronger, closer EU. Poland, Hungary and the Czech Republic are three countries that have not adopted the euro. Concerns from these countries over adopting the euro are evermore important as the countries’ citizens have low incomes. The meeting with the original six founding members ended when French prime minister Jean-Marc Ayrault petitioned for a political union that centered around the euro. Russian President Vladimir Putin vowed to “neutralize” Western threats, particularly those posed by American maneuvers near the country’s borders. With U.S. backing, Romania activated the $800 million missile shield at its Soviet-era base on May 12. Shortly before the move, Poland’s anti-ballistic missile shield had its northern wing installed. The U.S. also led a military drill in Georgia despite objections from Russia. Bloomberg quoted the Russian President as stating that the country must consider “how to neutralize the threats” for Russia’s security. Putin called the recent developments an attempt to “shakeup” the global security system. Combined with the deployment of U.S. ships carrying Aegis missiles in the Mediterranean and Poland’s additional shield elements, the Russian President accused the U.S. of leading a “new arms race.” Putin says Russia will not enter the race, and insists the country will go its own way. Putin’s plan is to continue the re-arming of its navy and army. Approved funds will be used in a way that will maintain the “current strategic balance of forces.” But Putin made it clear that Russia will make every effort to protect itself. The Russian President said preserving the balance of forces is the most reliable way to prevent “large-scale military conflicts,” and he would do everything necessary to maintain that balance. Putin dismissed the U.S.’s recent moves as a defense system, instead calling them a “nuclear strategic potential” brought onto Russia’s borders in Eastern Europe. He said “those taking such decisions” have, until now, lived in peace and safety. Robert Work, U.S. Deputy Defense Secretary, said the shield would not be used against missile threats from Russia. Frank Rose, a senior official for U.S. arms control, has warned that ballistic missiles in Iran may hit Romania and other parts of Europe. Putin dismissed the prospect of a nuclear threat from Iran, calling it an excuse to develop its missile shield in Europe. The defensive umbrella, which will be complete in 2018, will span from Greenland to Azores. The shields rely on radars that are capable of detecting ballistic missile launches into space. Sensors can then calculate the rocket’s course, and neutralize the missile before it has a chance to re-enter the earth’s atmosphere. Interceptors can be fired from ground sites or ships. Putin says the U.S.’s missile shield in Europe clearly violates the Russian-America arms treaties, noting that the anti-missile facilities may be repurposed to fire short and midrange missiles. Putin has threatened to pull out of the deal if Washington continues with its anti-missile objectives. Moscow says the U.S. missile defense system is designed to neutralize Russia’s offensive capabilities, a claim the Pentagon has rejected numerous times, and the launching systems may easily be re-equipped with offensive missiles. Just as the anti-missile shield is activated in Romania, NATO is beginning construction on yet another base in Poland, which is the final segment in the Eastern European shield. The groundbreaking ceremony took place at the base on Friday at Redzikowo, close to the Baltic Sea. In 2018, the base will have operational Aegis missiles. In a historic referendum, Britain voted to leave the European Union (EU) in what’s referred to as a Brexit, sending shockwaves across Europe and global markets into a tailspin. Adding to the political turmoil and uncertainty, Prime Minister David Cameron announced that he would be resigning by October. Cameron was the leading voice for the “Remain” campaign and is stepping down after voters ignored his arguments to remain in the EU. Ryszard Czarnecki of Poland, Vice President of the European Parliament, called the vote “a bad day for Poland” and said a Brexit will “weaken” the EU in many ways, including its relations with Russia. Czarnecki noted that on an internal level, France and Germany will strengthen. News of the controversial vote sent global markets reeling and the pound plunging to historic lows. Sterling tumbled to its lowest point against the dollar in decades. Emerging markets, including the zloty, were also weakened by news of the vote. Officials in Poland argue that Britain’s exit from the EU will have sharply negative effects on the European and British economies. Witold Waszczykowski, Poland’s Foreign Minister, says Britain will remain as a chief ally for Poland, despite the vote to leave the EU. There are approximately 850,000 Poles working and living in Britain. Waszczykowski warned that Brexit may cause a domino effect, with other member countries “blackmailing” the bloc and threatening to hold their own referendums. Poland joined the EU in 2004. Since then, roughly two million Poles have left the country in search of higher paying jobs. Many landed in the U.K., where the pay is often four times higher than in their home country. Poles are the largest non-British nationality living in the country. Poland’s National Bank estimates that Poles send home over £728m per year, helping to drive consumption in many areas of the country. For the estimated 850,000 Poles in Britain, especially those who just moved to the country, the future is still uncertain. Poles, and other immigrants, must live in Britain for five years before they can apply for permanent residency. The Polish Institute of International Affairs estimates that between 120,000 and 400,000 Poles arrived after 2012, meaning they would not be eligible for permanent residency. Those who arrived after 2012 would need to apply for a work visa and leave the country if rejected. Over the next two years, Britain will be negotiating its new relationship with the European Union, and those negations will almost certainly have an effect on the working conditions for Poles living in the U.K. In wake of the referendum’s results, the Polish newspapers asked if Poles would need visas or permits to work in Britain. The Rzeczpospolita ran the headline “The Great Cost of Britain” days after the vote, listing 10 potential disadvantages that included higher fees for students, work permits and the end of cheap flights between the two countries. Poland President Andrzej Duda says new efforts must be made to prevent other countries from exiting the EU. While Poland was largely in favor of the U.K. remaining in the EU, the exit may prove to be beneficial if more Polish workers return home with new skills. 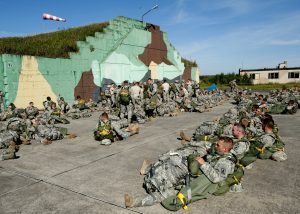 U.S. troops will be deployed to Poland as part of a larger NATO effort to keep Russia from meddling in Europe’s affairs. A continuous deployment of 1,000 U.S. troops to Poland will commence next year as part of NATO’s plan to deter, or intimidate, Moscow and allow allied partners stationed near Russia’s border to prepare for hybrid warfare. Speaking at the NATO summit, President Barack Obama said that Poland would be “seeing an increase in NATO and American personnel” as well as advanced military equipment. The president spoke alongside Polish President Andrzej Duda. Obama reaffirmed his commitment to Poland as an ally, noting that the country can “remain confident” that NATO will stand with them always. The president’s announcement follows NATO’s previous plans to establish four new battalions for northeastern regions of Europe, one at each of the following: Latvia, Estonia, Lithuania and Poland. The two-day summit allowed the 28 member states of the alliance as well as Montenegro, which is expected to join in the near future, an opportunity to solidify deployment details. Canada, the U.K. and Germany will lead battalions in the Baltic states, while the U.S. will deploy an armored brigade combat team to Poland in 2017. U.S. units will rotate for the foreseeable future. Equipment will also be sent for a second brigade in Europe at a site that has yet to be determined. 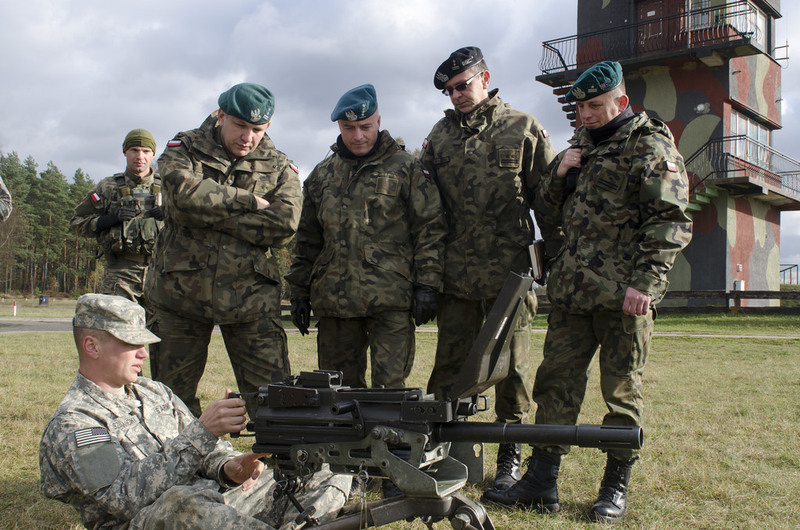 NATO’s effort to ramp-up forces in Eastern Europe is the largest movement of alliance troops since the Cold War. The goal is to soften fears that foreign meddlers may provoke uprisings in countries with ethnic Russian communities, like what Russia has been accused of doing in Crimea and Ukraine. A senior defense official said the battalion sends a message to “Russia or anyone else” that the alliance will defend its ally, and has the means to do so. “The boots are right there,” the official said. The presence of each member’s forces also gives the host country an opportunity to boost its defense against threats of hybrid warfare, including insurgencies disguised as civil uprisings and cyberattacks. Obama’s announcement on Friday points to a shift in sentiment toward a military alliance reminiscent of the Cold War era. The primary complaint amongst defense hawks is that the majority of NATO’s member states do not meet the alliance’s goal of 2% of their GDP allocated to defense. Just five of the 28 member states meet this goal. Those close to the matter say there is a stark contrast in attitudes among defense chiefs in member countries. After making a pledge at the previous NATO summit two years ago, 23 out of the 28 member nations have reduced their defense spending and are now investing in military modernization. However, they still do not meet the allocation goal. The summit also focused on discussions, both formally and on the sidelines, on the best ways for member states to keep an open dialogue with Russia and to preserve potential opportunities to work together in the future.